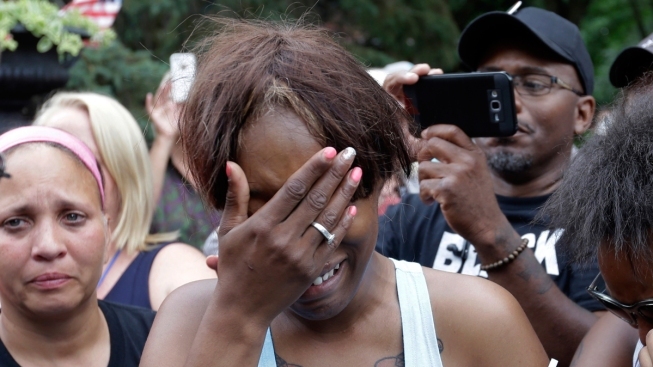 Diamond Reynolds, the girlfriend of Philando Castile of St. Paul, cries outside the governor's residence in St. Paul, Minn., o, July 7, 2016. The police involved in the shooting have been identified. The St. Anthony, Minn., police officer who shot and killed Philando Castile was identified Thursday night as Jeronimo Yanez, a four-year veteran of the department. The Minnesota Bureau of Criminal Apprehension said Yanez and Officer Joseph Kauser, also a four-year veteran of the St. Anthony force, were placed on administrative leave. Yanez and Kauser stopped Castile's car about 9:05 p.m. (10:05 p.m. ET) Wednesday for a traffic-related violation in Falcon Heights, the state agency said. According to investigators, Yanez approached the car from the driver's side, while Kauser approached it from the passenger side. "At one point during the interaction, Officer Yanez discharged his weapon, striking Castile multiple times. No one else was injured. A gun was recovered at the scene," the BCA said.